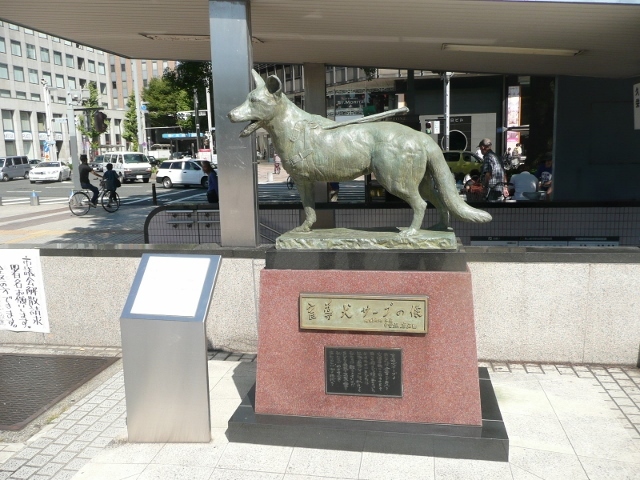 A few years ago I was lucky enough to visit Nagoya in Japan for a conference on environmental history where I took a photo of a statue (below) of a dog in the city centre. Not being unable to read Japanese, I’m not sure what this statute commemorates (if anyone does know, please get in touch!). I was reminded of this statue when reading Aaron Herald Skabelund’s recent book Empire of Dogs: Canines, Japan and the Making of the Modern Imperial World (2011) which discusses another Japanese dog statue, this time in Tokyo. This statue commemorates Hachikō, a Akita dog who would follow his master, a professor at Tokyo Imperial University, to Shibuya station each day until the day his master died suddenly at work in May 1925. Echoing the actions of Greyfriars Bobby (see my previous blog) Hachikō, pictured below, waited for his dead master at the station for many years afterwards. 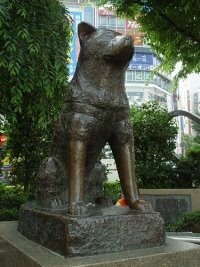 Hachikō became celebrated as a symbol of devotion and loyalty and on 21 April 1934 a statue was unveiled to him amidst huge crowds. A mini-souvenir industry sprung up around Hachikō and he made it into school textbooks as a way of imparting the importance of devotion and self-sacrifice to Japanese school children. Numerous books and other publications have celebrated Hachikō’s story, which was also made into a 2009 film starring Richard Gere. But Skabelund reminds us that there is a darker, and more interesting, history behind the Hachikō statue. 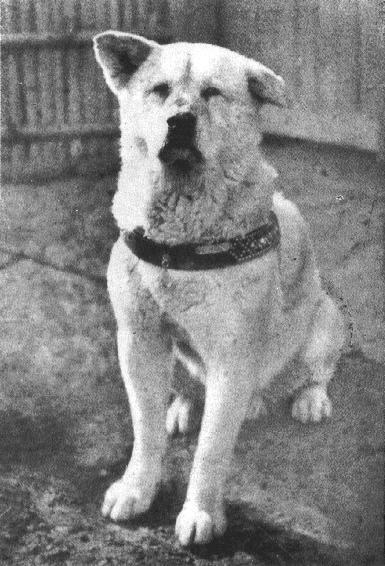 At a time when the Japanese state was flexing its imperial muscles and creating a stridently nationalist culture (which can be described as fascist), Saitō Hirokichi founded the Society for the Preservation of the Japanese Dog, with the aim of protecting and promoting “native” Japanese dog breeds (those with pointy ears and curly tails). Saitō believed that Japanese dogs were superior to Western breeds, characterized as they were by their strength and devotion, and their close bonds with the Japanese people: ‘No other dog has been the recipient of the superior attributes of the Japanese national spirit – courage, composure, boldness, and loyalty – that have been ingrained and preserved through interacting and dwelling with the Japanese nation for thousands of years.’ But Saitō fretted that Japanese dogs had been weakened through contact with Western dogs and he persuaded government officials to protect seven dog breeds under the 1919 Law for Preserving Scenery and Historic and Natural Monuments. Saitō also played a key role in making Hachikō a symbol of the supposedly superior Japanese dog, even though some unconvinced observers noted that one of his ears drooped and that he may have been drawn to the station by the chicken kebabs sold by nearby vendors. The history of Hachikō shows the ease with which dogs are incorporated into national identity (think of the British bulldog) and how dogs’ apparent devotion can be mobilized for a variety of cultural and political objectives. It also shows how we have to look beyond the sentimentalization of dogs if we are to better understand the complexity, and darker side, of human-canine histories. To find out more about Hachikō and the “invention” of the modern Japanese dog, Empire of Dogs is well worth a closer look. Short answer: 2 dogs that survived being abandoned by a Japanese research expedition in Antarctica. An article for your next blog there, I think. Those dogs abandoned in Antarctica were Taro and Jiro, whose taxidermied bodies can now be found alongside Hachiko’s at the Nat’l Museum of Nature and Science in Ueno. A good account can be found in Pawprints in Japan. Film version Antarctica [Nankyoku Monogatari, Dir. Koreyoshi Kurahara and I think relatively recently retold in a TV series]. The statue you posted commemorates “Serve” (Saabu) a seeing eye dog. She was born in 1977 and trained with the Japanese Guide Dogs for the Blind. In 1982, she slipped on ice in the course of work, resulting in a serious injury that caused the amputation of her front left leg (I think that’s what the Wikipedia article says — my Japanese is only so-so). Because of her injury, widespread attention was drawn to the importance of seeing eye dogs, as conveyed through the slogan, “Guide dogs are a part of [an extension of] the bodies of the visually impaired.” And because she was injured, her person received a liability insurance payout as laws were modified to acknowledge the role of working guide dogs after this incident. She passed away in 1988. I am not sure if she continued to serve after her injury, but she was no doubt well loved and cared for. Oops, I guess this demonstrates why I was never much good at history. I jumped at the first reference of statues of dogs in Nagoya. Thanks for putting the record straight. Sorry for the wild goose chase. …. however …. can we be absolutely certain that Taro and Jiro weren’t suffering from snow blindness after their year abandoned in Antarctica, and weren’t also being recognised in that statue …….. just a thought …..
How can we ever see the light, if we will not look at the dark! Thank you for this post. As we are the story telling animal, all to often we create stories that serve our own needs, and forget the very real needs of others – I find this sadly in abundance in our relationship with most species of canids. Thank you for your research. Another wonderful post, and another point of view. It’s hard to think of these wonderful creatures as a vehicle for propaganda and hate, but it is blatantly clear how easy it can be. Scary stuff. Another wonderful post, and yet another point of view. It’s so hard to see these faithful creatures being used as instruments of propaganda and hatred but obviously we humans will never measure up to the the dogs themselves. Scary Stuff. Nice blog !! thanks a lot of for sharing a useful information about the pet training. Here’s an article that explains Serve’s story. The statue has been moved several times and the general population here are unaware of where to find it (even though it is in front of Nagoya Station. Thanks – that’s useful info.